I love arugula! So when I shop the local farmers market I look for the freshest greens for my salads. For this recipe I chose the smallest variety, and came home to make a fresh salad with all that I had purchased. Fava beans were on my mind and now in season. My mother made a traditional recipe made with artichokes, and she would stew them, and they were delicious! But, I wanted something fresh and new. I decided on Italian fresh basil from my garden, and round yellow squash from my CSA box. 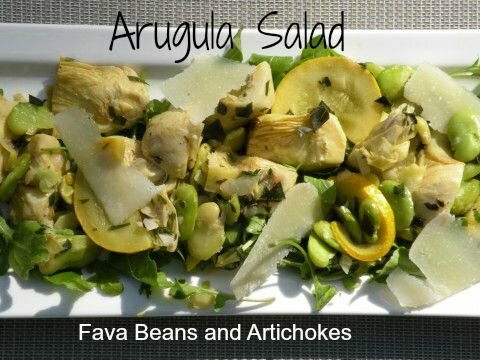 You can substitute frozen fava beans and artichokes from the jar. Fresh Fava Beans: Remove the beans from the pods. Boil water in a small pan and blanch the beans for 1 minute.Remove and cool. Peel outer skin from the bean. In a skillet place the olive oil in the pan and saute the onions until soft. Add the fava beans, artichokes, squash, salt and pepper, parsley and 1/2 cup water. Simmer until the beans are tender. Remove from the heat and add the basil and lemon juice. 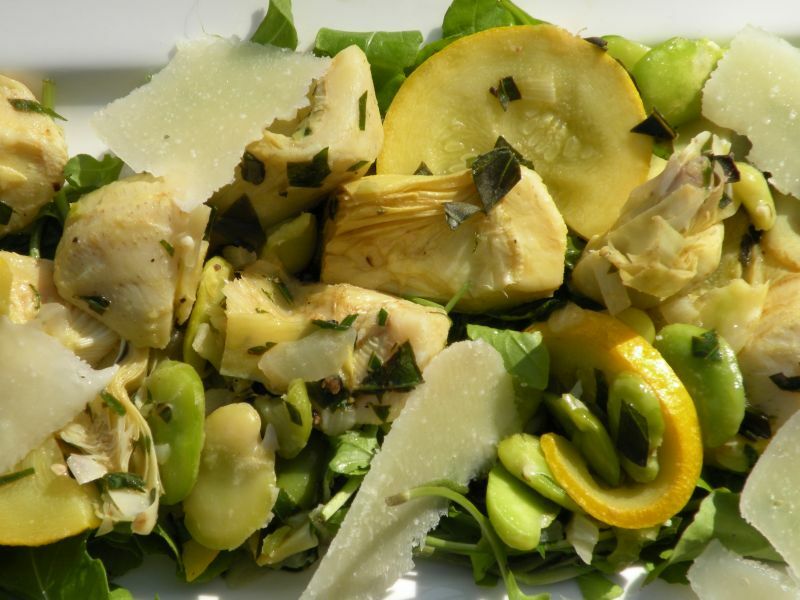 Place the arugula on each individual plate and add the warm vegetables evenly on top. Add the cheese and a splash of balsamic, and a drizzle of olive oil on each plate. © 2011 – 2018, Mary Papoulias-Platis. All rights reserved.